This article covers 5 free homework planner apps for Android. Student life is very busy, sometimes with friends, sometimes with family, sometimes in studies and other work. If we count the studies only, that alone has lots of stuff like homework, classes, assignments, tests, extra-curricular activities, etc. In such situations, a homework planner app can be really useful. It helps you keep track of homework, assignments, submissions, deadlines, upcoming events, etc. With a homework planner app, you can plan your homework, see what’s due, what’s done and what’s approaching its deadline. 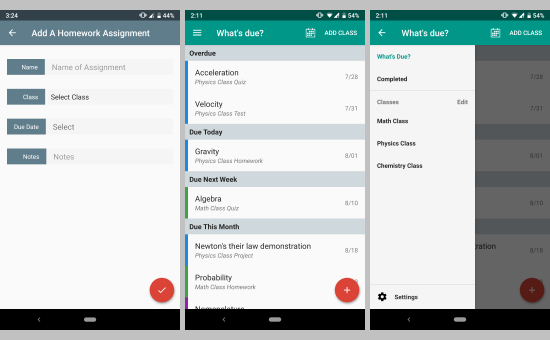 Apart from the homework, you can also plan other study-related stuff with these Android apps. You can add your class timetable and the app will notify you for the coming class. You can also add your class tests, quizzes, presentations, etc. and keep a track of all of them. 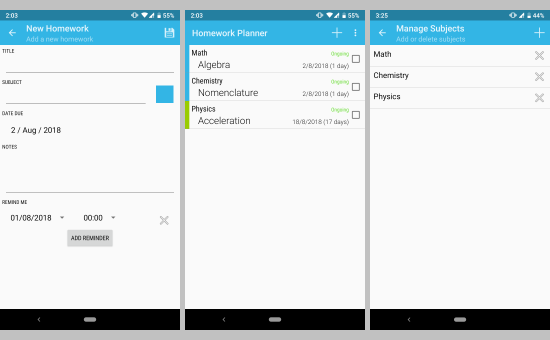 Egenda is a free homework planner Android app. When you open this app for the first time, it asks you to add your subjects and classes. Once that is done, you can start adding your homework to this app along with deadlines. Apart from the homework, this app also has options to add quizzes, tests, and projects. In terms of management, this app shows you what work is due; it shows all the deadlines there. It also lets you browse homework for a particular class or subject. This app also has a Calendar view where it maps all the timelines on the calendar. You can download this homework planner app here. myHomework is another free homework planner app for students. In this app, you can plan all sort of study-related tasks. You get various options and tags for homework planning. When you add a new homework, you can add class, type, due date, due time, recipients, attachments etc. You can also assign a priority level to your tasks here. The main screen of this app has four tabs, Class, Priority, Type and All. The Class tab shows all the tasks for all your classes. Priority tab arranges all the tasks by their priority level which gives you a clear idea about what you should do next. The Type tab sorts the tasks by their types i.e., assignment, quiz, test, presentation, or any other type you mentioned while creating a task. And, the All tab shows all of your tasks arranged by their deadlines. 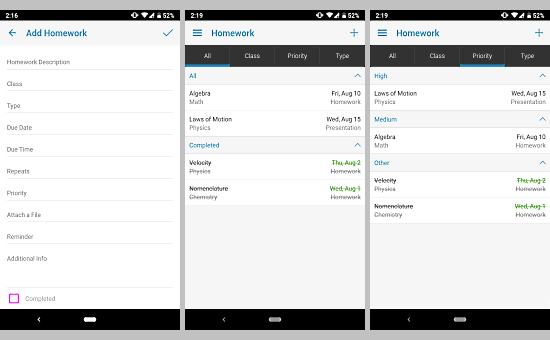 With this app, you can easily keep a track of all your homework tasks. Download this homework planner app here. 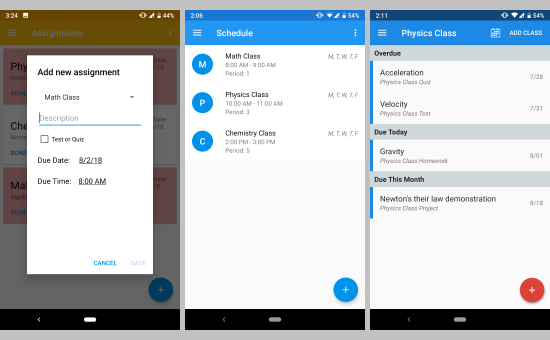 School Planner is another feature-packed Android application for homework planning. In this app, you can plan all your student activities, tasks, timetables and more. On the main screen, it shows you an overview of all you have in the following week. From there, you can jump to your agendas, calendar, timetable, and subjects. Apart from the homework, this app can also help you keep a track of your attendance and grades. You can also add contacts of your teachers, and add attachments and recorded lectures to your homework tasks. You can also add your class timetable in this app. This way it will notify you for your coming classes so you won’t miss any. This is the only app on this list that lets you backup your data. You can create a backup of your data to Google Drive and restore it when needed. Here is the link to download this homework planner app. The next homework planner on this list is Student Planner. 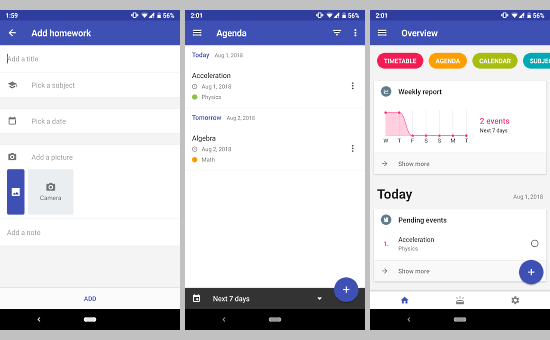 It is a simple homework planner app with an intuitive material design UI. In this app, you have to add your subjects first. After adding the subjects, you can add homework assignments for those subjects there. While adding a homework assignment, you can specify its type and add due date and time. The main screen of this app shows all your assignments. From there, you can jump to Schedule where it shows all your tasks sorted by their deadlines. You can also browse your tasks subject-wise here. Apart from that homework, you can also add a timetable for your class schedule and exams in this app. Homework Planner is the simplest homework planner app on this list. It doesn’t offer any additional feature like other apps on this list; the main and only focus of this app is homework planning. To start homework planning with this app, first, you have to add your subjects. After adding all the subjects, you can add homework to the app. While adding a homework, you can select a subject, add a due date and additional note. You can also create a reminder for the task which will remind you of the pending tasks. This app lets you create multiple reminder of a task; this can be really helpful for urgent and important tasks. With these minimal simple and useful features, Homework Planner is an extremely efficient homework planner app without any additional distraction. These are the 5 free homework planner apps for the students. This app can really help you manage all your tasks so you won’t miss any deadline.